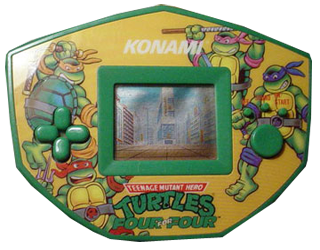 Before the Game Boy came on the market in 1989, the only way to enjoy a handheld video game was in the form of an LCD gaming unit, popularized by Nintendo themselves with the Game & Watch series throughout the early 1980s. 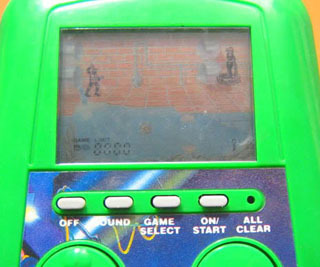 These games were done by having a custom display per game and using LCD lighting to light up the different shapes to allow for detailed graphics, though at the expense of deeper interactivity. During 1989, Konami began producing their own line of LCD game systems based on their most popular titles, ranging from Gradius to Contra and replicating the familiar premise of their console counterpart into a smaller yet recognizable portable product. 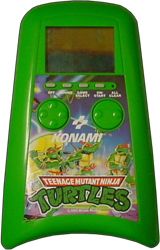 The most popular of Konami's LCD handhelds was arguably the TMNT line, with the very first being released only a few months shy of the American release of the Game Boy in 1989. 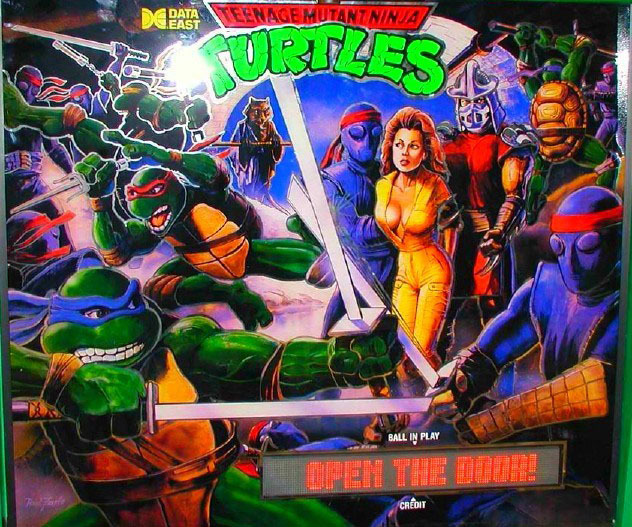 Teenage Mutant Ninja Turtles tells the story of April once again being captured by Shredder (who is described as a villain more vicious than an army of mind-altered Bruce Lees on the packaging) and the Turtles set out to rescue her in Shredder's lair. There are 2 modes of play that differ from each other, an unusual addition of diversity for an LCD unit. 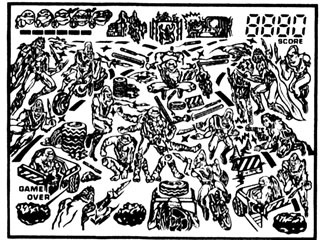 The general premise has April caged in a cryo-tube and green machines having to battle their way into the waters to acquire an item to set her free. 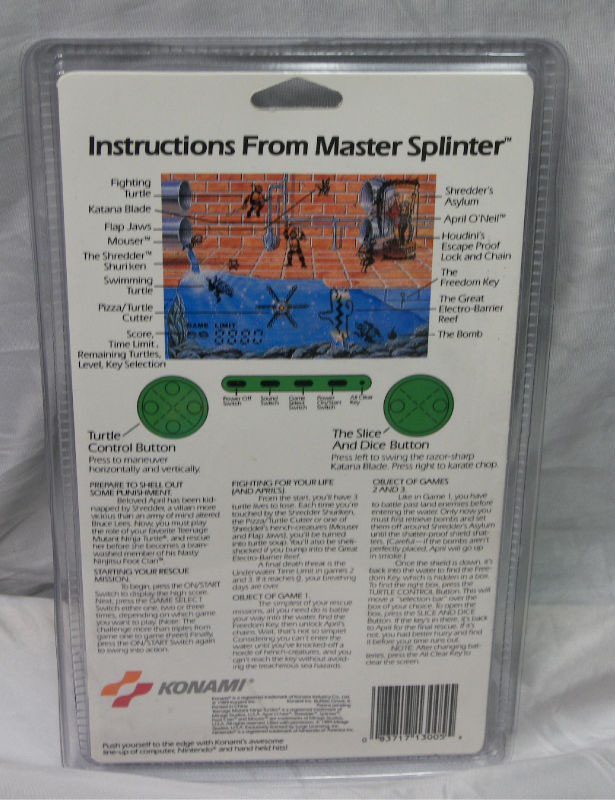 There are shurikens, mousers, pizza cutters and Shredder himself to go through, making the challenge of getting safely in the waters and back all the more great. In Game Mode 1, there objective is to get the key which is hidden in the dangerous underwater cave to set April free from her holding cell. In Game Mode 2 and 3, there are bombs that need to be set around April's tubetastic cage in order to shatter it and free her, with double the amount of enemies and dangerous to defeat and maneuver around. Getting the bombs from the underwater cave and setting them isn't quite enough, they must also be set properly in order to actually break the cell, or else April herself will become a sliced pizza sent in ever which direction. 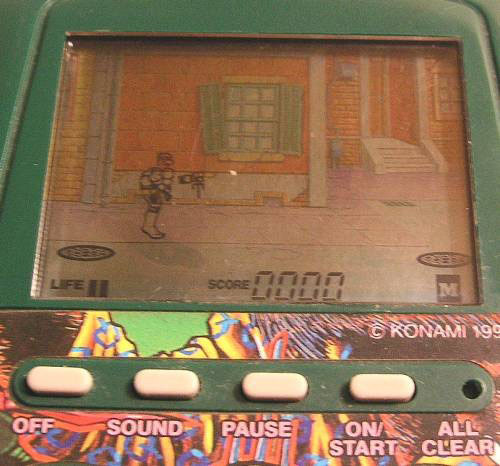 The differences from Mode 2 to 3 are purely speed related to enhance the difficulty. 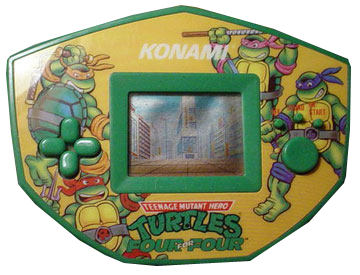 For an LCD game, TMNT is actually a surprisingly decent challenge and interesting enough of a concept to be enjoyed even when compared to the much more sophisticated Game Boy, though naturally the game's longevity is limited due to it being a once scene affair due to its limitations. 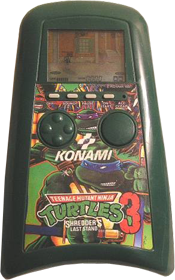 It holds enough Ninja Turtles charm to justify its existence, with good graphical representation, familiar (though ever so grating) sound and the iconic green casing. It's now considered a collectors item and fetches up to $30-50 if sold as new. 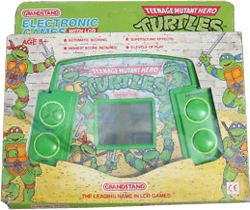 The game contradicts the turtles ability to hold their breaths for an extended amount of time underwater as seen in the first NES game by limiting the time allowed to mere seconds before they drown. Real life. 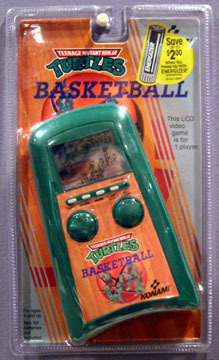 After the release of the Game Boy, the LCD prevailed as a sort of cheaper alternative to the designated handheld systems that had been released by Nintendo, Sega and Atari amongst others, allowing kids to still enjoy games on the go. 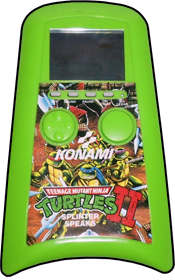 Building on their own success of the first LCD TMNT game and the ever growing brand, Konami released the follow up one year later, titled Splinter Speaks. 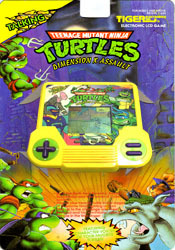 The multi layered controls and premise is scaled back for the sequel, rather opting for the more standard swing and bang game that LCD games is often associated with, situation the turtle of choice in the middle of the screen with his arms extended, swinging at Foot soldiers and mousers as well as familiar boss characters such as Bebop and Rocksteady, before eventually facing Shredder himself, with each stage being harder than the one before. 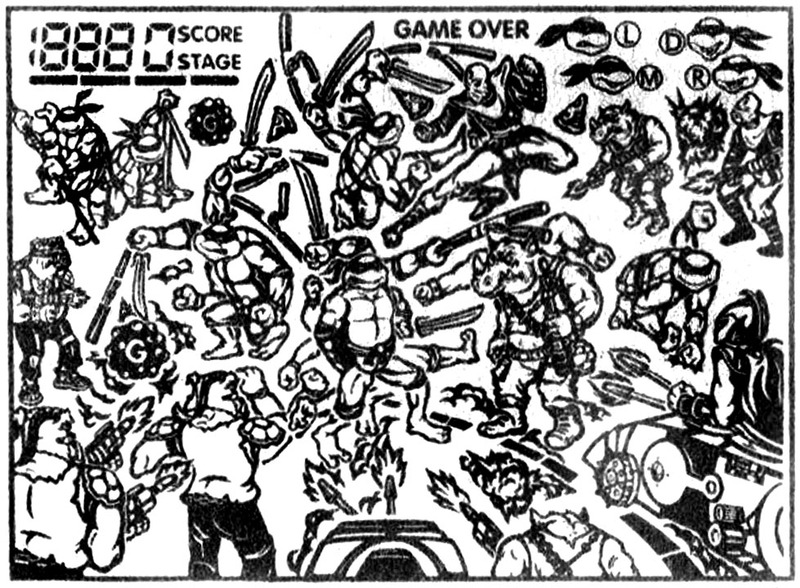 Enemies comes from all all corners of the screen, and the turtles have an attack per alignment in order take them out accordingly. 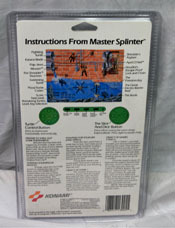 Splinter Speaks is mostly remembered for the incredibly loud sound clips and theme song that plays, which made every parent deeply regret the purchase since the song plays between every stage, transmitting well beyond the intended listener. 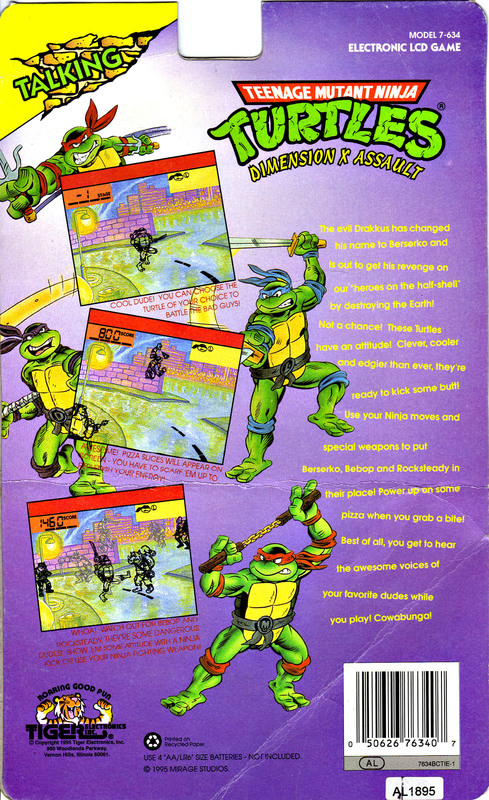 It also came with a Pizza Hut coupon much like The Arcade Game for NES and some subsequent releases. 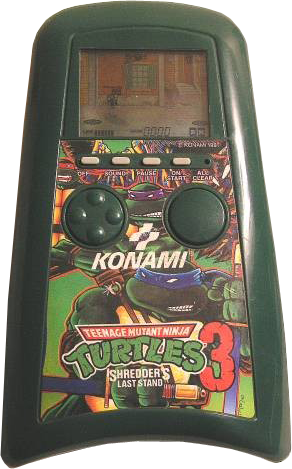 The third and last in Konami's numeric series of TMNT LCD handhelds was 1991's Shredder's Last Stand. Shredder has now unleashed 2 new mutants onto the street, Metaligore and Rotagilla, to stop the TMNT and take down NYC once and for all. The game plays identical to that of Splinter Speaks, with the turtle of choice being set in a centered position and taking on enemies from all corners of the screen, and fighting off the bosses at the end of each stage. After defeating the boss, the life bar is repleted, and the next stage is harder as you go along, facing more enemies at greater speeds and more resilience. The graphics have taken a great hit on Shredder's Last Stand, as have the sounds which sounds exceptionally Rick Ruddish, making you turn your head and sling obscenities back at the little unit in hopes it will be silenced. 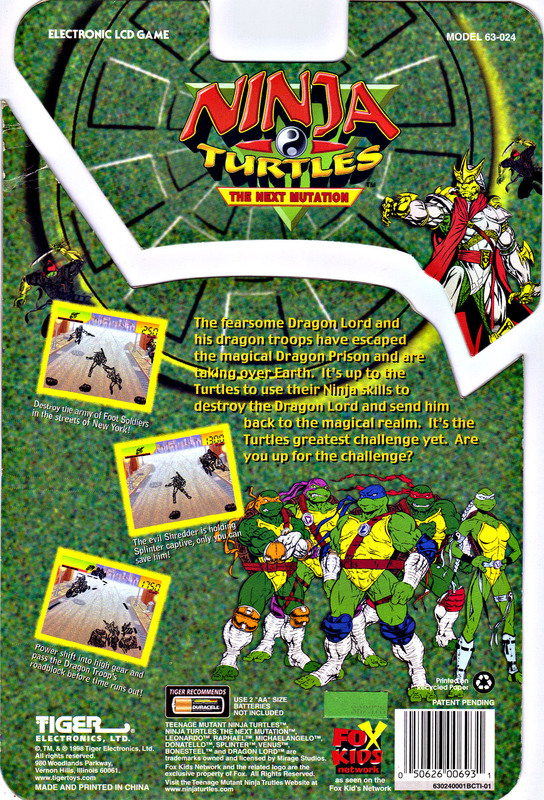 Despite Shredder's prominent role in the title and on the back packaging, he does not actually appear in the actual game. 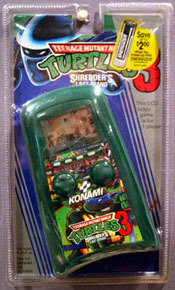 Now this is a story all about how, Konami flipped-turned the turtles upside down. 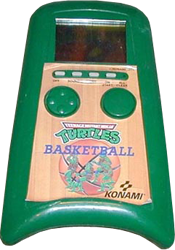 And I like to take a minute to just tell you all, how you play this little game called Turtles Basketball. 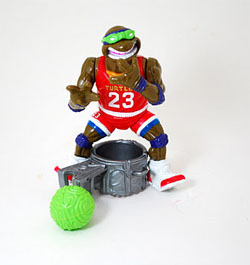 In dirty rotten sewers born and raised, shootin hoops in the toilet bowls most of their days. Shelling out, maxing, relaxing all cool, And shooting some b-ball ploppin in the stool. When a couple of guys said were up in no good, Started making trouble in their neighborhood. They got in one little fight and Splinter's temper ran short And said you're taking on those punks on the basketball court. 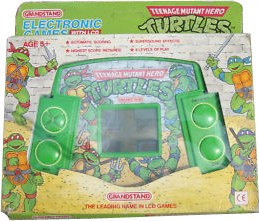 You simply steer the turtle and when they come near, the Technogoons can be dribbled and left to bite your rear. Running point to point and avoiding Shredder's snare, you look up, yeah you got it, it's time to make air! You score points that depends on the general distance, and the time you decide to depends on rival resistance. 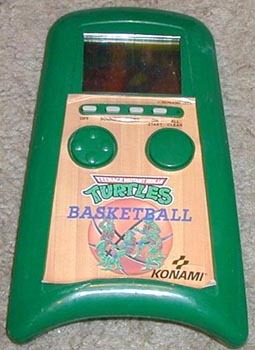 Look at the court and if you are totally clear, then you're going to win cause Turtles B-Ball is fair. The idea for this game came from the action figure Slam Dunkin' Don which was released in 1991 by Playmates. This figure also received a white redesign exclusively sold at Wal-Mart. The British toymaker Grandstand released their own LCD unit in 1991 based on the 1987 cartoon series and retaining the Hero Turtles name. 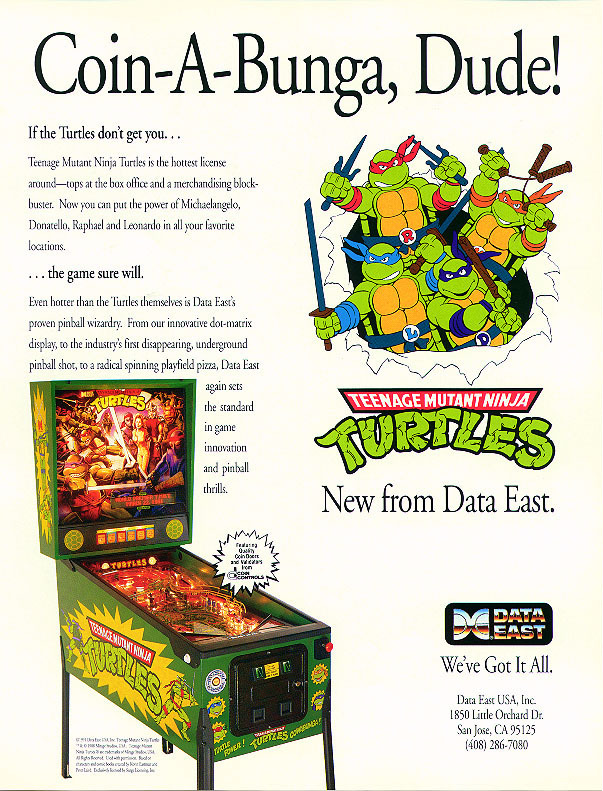 Grandstand's game takes place in an intersection with at a slightly isometric angle and throws bad guys at the Turtles from each direction. 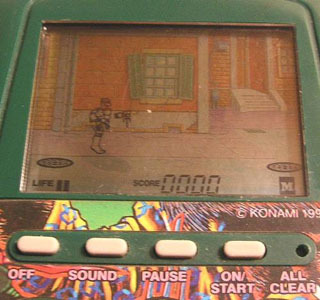 There are 9 levels to play through with each level having rapidly faster enemies the higher you go, and the high score is saved even when switched off. 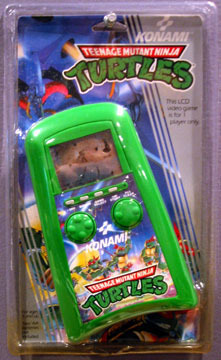 Like most LCD units, it also features incredibly loud sound and a small clip of the intro music from the cartoon. It was only released in the UK and some Northern European countries. 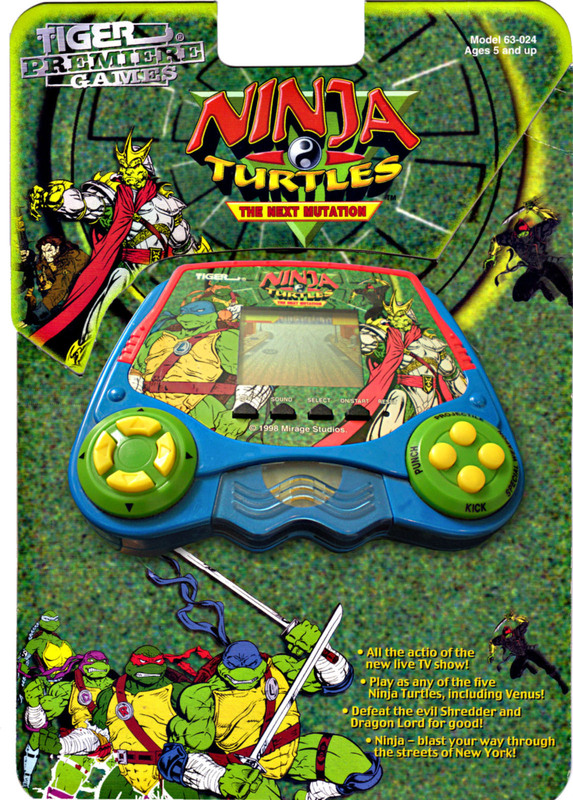 Konami released their last TMNT based LCD game exclusively on the UK market. With a much more conventional looking design and limited release, Four for Four is more or less a slight redress of Splinter Speaks, without all the sound clips and a softer rendition of the theme song. 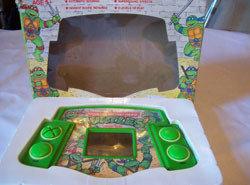 Tiger Electronics, arguably the biggest LCD game distributor of all time, got their hands on the TMNT license after the franchise started to dwindle in popularity during the middle parts of the 1990s. 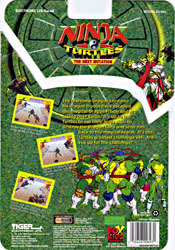 The game pits the Ninja Turtles up against Berserko, formerly known as Drakkus and a villain from the latter seasons of the 1987 cartoon. 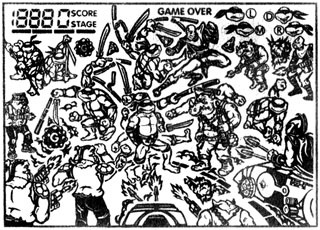 At each stage, the turtle chosen must defend himself from the Foot, Bebop and Rocksteady while taking care of the Gamma Bombs which Berserko has planted in order to destroy Earth. Berserko shows up in his evolved annihilator form during the last stage. 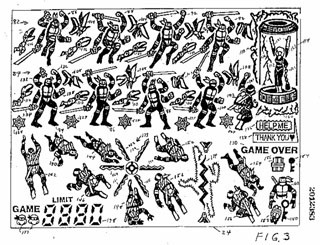 Strangely, the manual refers to the Foot as Cyber Soldiers and underlings of Berserko, something which was never the case in the original cartoon. 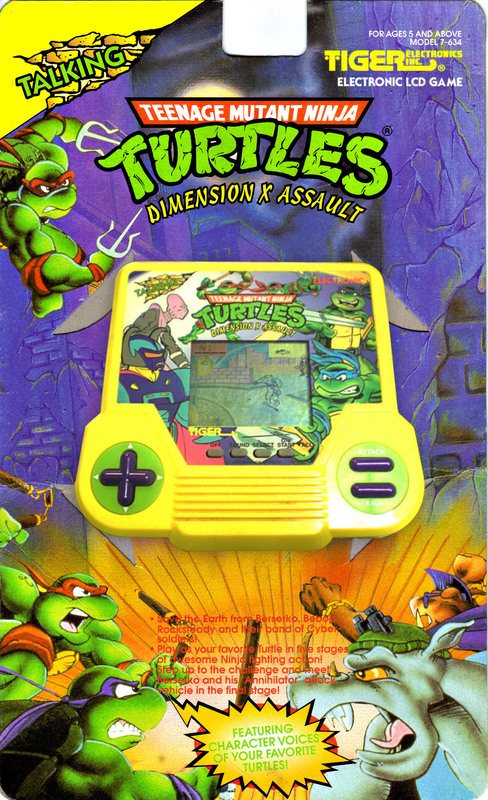 It also confuses the identities of Donatello and Michelangelo. The art was done by Ken Mitchroney. 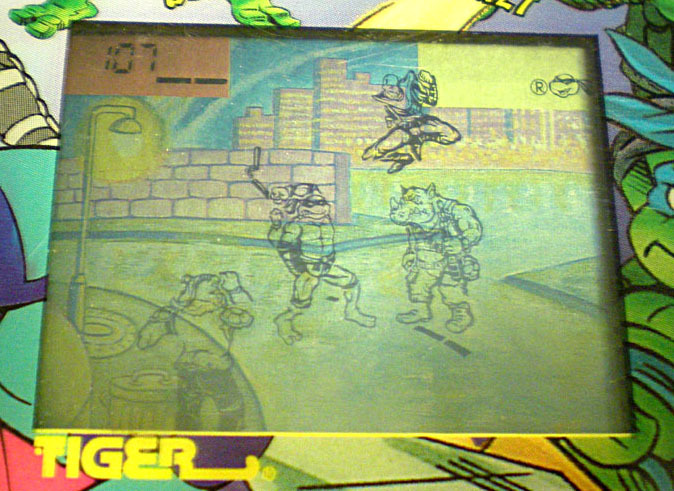 Tiger's second TMNT adventure would again strike the curious corner, being based on the very ill fated television from Saban. This game marks the one and only time that Venus appears in a TMNT game. 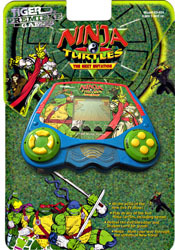 The 5 Ninja Turtles faces off with the Dragon Lord and his minions divided into two different styles of play, Hand to hand combat and driving the Mutant Marauder hummer. 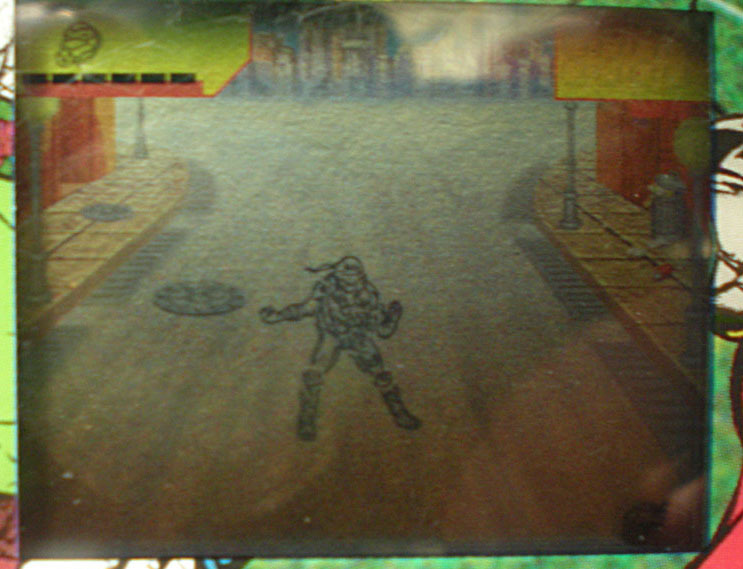 During the hand to hand stages, enemies will come from all angles and must be defeated before they reach you, while the hummer needs to be navigated to avoid the bike riding Ninja Riders. 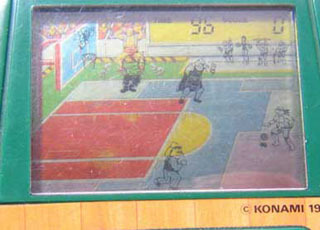 During the hummer levels the players have infinite lives, though with a time limit. At the final stage, Dragon Lord himself must be defeated. The Next Mutation packs a good challenge and is helped by the novelty factor of being the only Next Mutation game in existence due to the PlayStation game being cancelled. 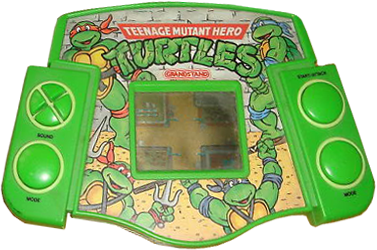 The graphics are quite good, with each character having a decent amount of detail, though most of the turtles share their features, only changing weapon when chosen. 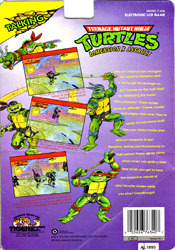 The packaging makes use of Michael Dooney's illustrations rather than the live action suits seen in the show. 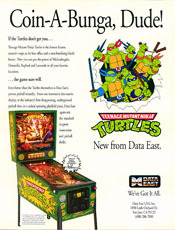 At the height of their popularity, the Ninja Turtles also were the subject of a popular pinball machine much like all other successful blockbuster movies and franchises during the early to mid '90s. 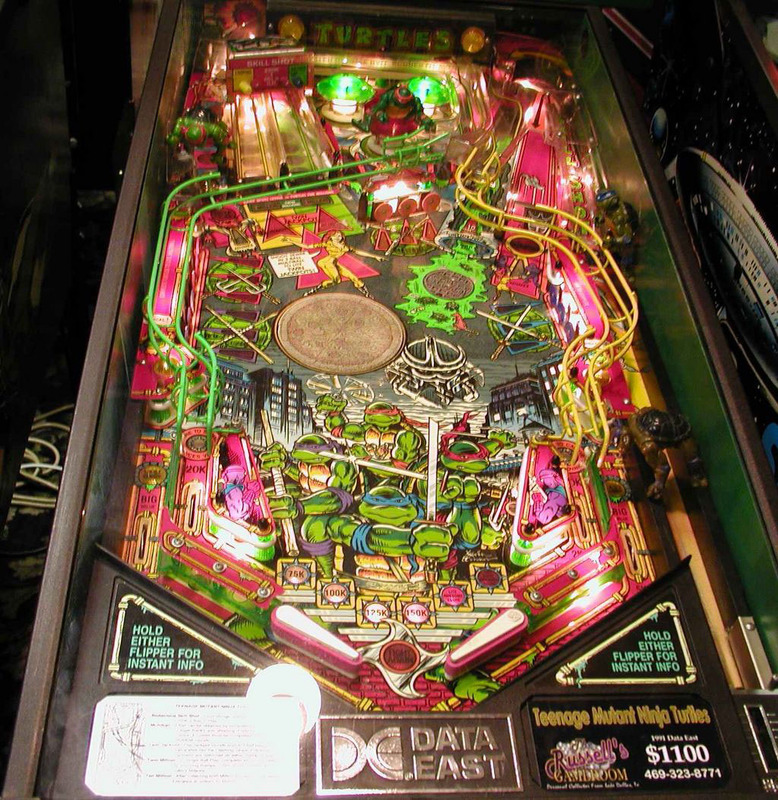 Manufactured by Data East, it was designed by Joe Kaminkow and Ed Cebula, both of whom worked on several other popular pinball machines such as Star Wars, Robocop, Last Action Hero and Back to the Future. 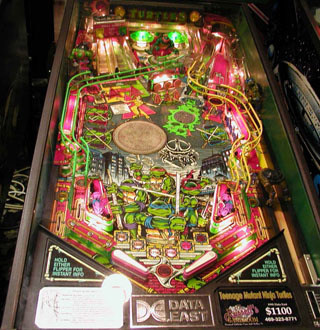 The play field consists of several zones of standard pinball affairs, giving out bonuses and pinballs, with the video display on the back glass providing small animations and sound set to the action. 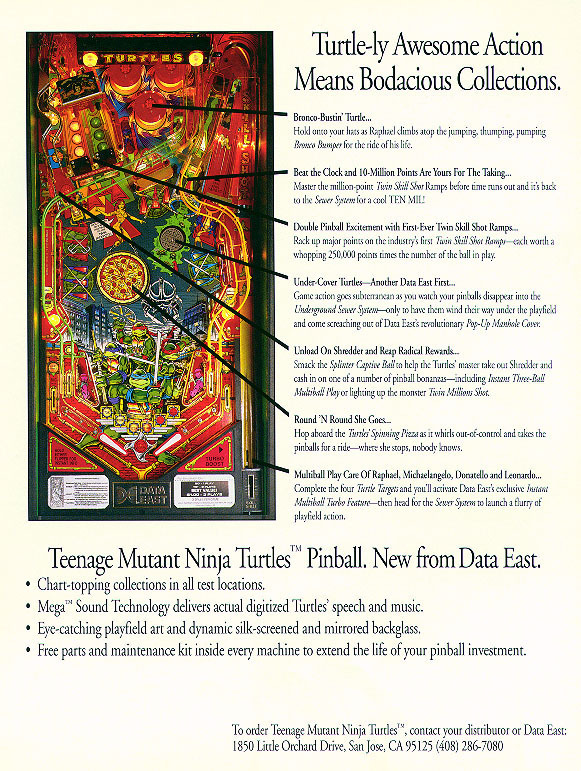 Some examples of the zones are the Spinning Pizza which will spin and send your ball flying, the Bronco Bumpers and the Splinter Captive Ball which frees Splinter from Shredder's clutches. 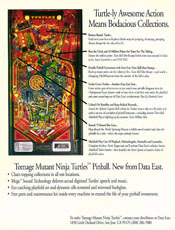 The Underground Sewer System is an exclusive feature to the TMNT board, and will send the ball underneath the play field and send it out flying from the mechanical manhole. The board is interesting both in terms of the good looking art, done by Kevin O'Connor and Paul Faris, and the decorations to certain sections beneath the glass. 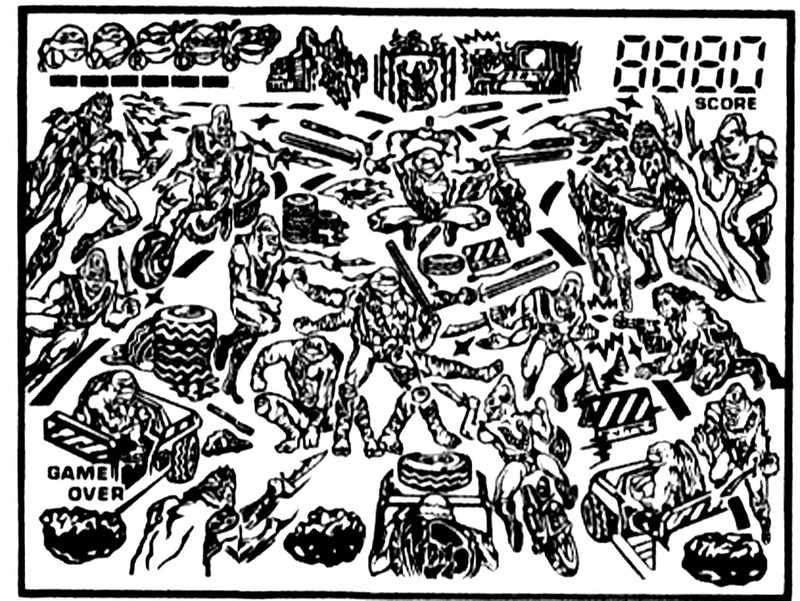 Due to the overproduction of the Playmates TMNT action figures, each TMNT has several action figures mounted around, completely unaltered from their retail versions. April also features a nice pair of bumpers herself on the back glass art. All of the artwork and the many speech samples in the game is based on the first live action movie from 1990.